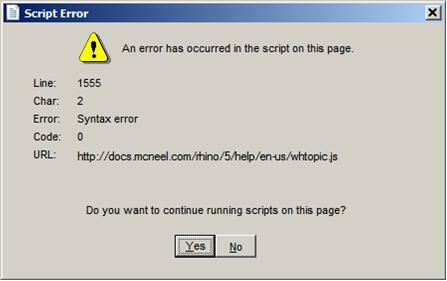 An error occurred in the script whtopic.js as shown below. This is a Java error when trying to play videos in the Command Help panel. Normally this is a sign that Java on the computer has not been properly updated or corrupt. Installing the most recent Java will correct this. Download and install the most recent Java. Try to start Rhino and see if the problem still exists. Start Rhino in Safe mode. Type CommandHelp and then press Enter at the command line. Do this only once! Try starting Rhino in normal mode.